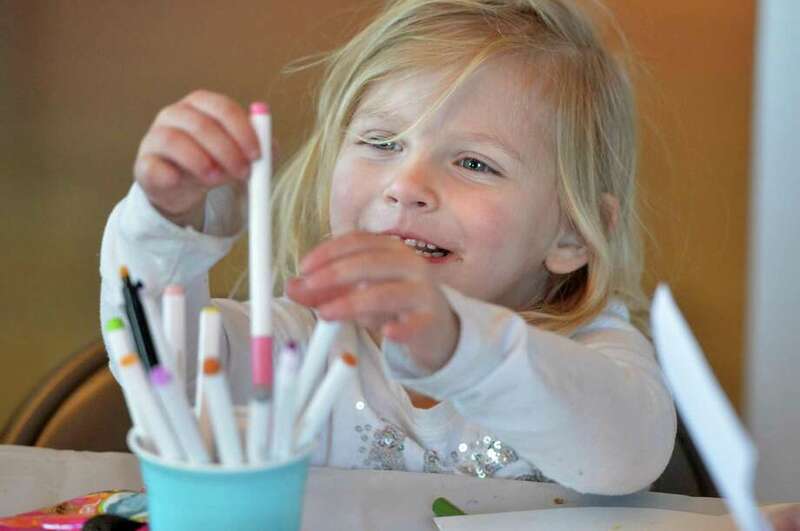 Four-year-old Cassidy Neff, from Fairfield, chooses her colored markers for a thank you letter for a police officer during Operation Thank You at The Norwalk Museum on Jan. 14. The Unquowa School’s student literary magazine, Pen & Paper, has earned top honors in two national competitions. Unquowa’s competition included public and private middle and high schools as well as colleges and universities nationwide. Unquowa’s 2017 Pen & Paper also won praise from the Columbia Scholastic Press Association. In their annual review it earned a “Gold Medal Rating” in every evaluation category. George Seferidis, a humanities teacher, is the publication’s advisor. The Unquowa School, a coeducational, independent day school, draws students from Fairfield, Easton, Westport, Bridgeport, Stratford, Darien, Greenwich, Shelton, Norwalk, Weston and Wilton. Sixty-three Fairfield natives made the fall dean’s list at the University of Connecticut: Olivia Anderson, Heather Anderson, David Bachoy, Mary Ball, Grace Bentley, Brandon Bisack, Cella Blumenfield, Sarthak Bothra, Carly Bria, Julia Butzko, Renee Castro, Nora Chov, Samin Chowdhury, Sowon Chung, Fikreta Cirikovic, Michael Connelly, Matthew Crowe, Natalie De La Garrigue, Alexandra Deangelis, Nicholas Demaso, Kelly DeMeo, Kristin Errett, Adela Fejzaj, Michael Fox, Andres Galindo, Nicholas Godfred, Ana Hardiman, Zoe Hochberg, Sean Homa, Valerie Jarret, Jisoo Kim, Jared Klukas, Joseph Lapreay, Ian Leighton, William Mandelbaum, Dana Mansour, Nicole Marino, Sadie Moncayo, Daniel Munteanu, Amy Nelson, Justin Ng, Ari Nishimura-Gasparian, Julia Oppenheimer, Michael Pehota, Richard Perret, Carlee Pickering, Alyssa Pierne, Iqra Qureshi, Jenifer Repaci, Leslie Rojas, Jacob Routhier, Kiara Sardinha, Thomas Scheller, Gabrielle Sharbin, Brooke Siegel, Nicholas Stanton, Eric Styrcula, Bao-Anh Tran, Nicole Triunfo, Bernston Valenzuela, Sofia Wall, Corbinian Wanner and Morgan Wyckoff. From Southport, Jason Hsieh, Brendan Layne, Griffin Love and Alexander Scott also made the dean’s list. The UConn students were registered for at least 12 credits, received no grade below a “C,” had a grade-point average of at least 3.0 and were in at least the upper quartile of their school or college. Five Fairfield natives have been named to the fall 2017 dean’s list at Stonehill College in Easton, Mass. To qualify for the dean’s list, students must have a semester GPA of 3.50 or better and must have completed successfully all courses for which they were registered. Fairfield Ludlowe High School graduates Meghan Maciejewski, class of 2018, Edward Magi, class of 2020, and Elizabeth Revay, class of 2018, made the dean’s list, as did Colleen McGuinness and Jacquelyn O’Brien, both members of the class of 2020 and graduates of Fairfield Warde High School. Curry College in Milton, Mass. announced four Fairfield natives were named to the dean’s list for the fall 2017 semester: Abigail Benyon, Khaila Fitzgerald, Michael Hughes and Matthew Katz. Luke Vitale, of Fairfield, was recently named to the President’s List at The State University of New York at Potsdam. Vitale, whose major is exercise science, achieved the honor of being on the President’s List by satisfactorily completing 12 numerically-graded semester hours with a GPA of 3.5 or higher. Carson G. Goos, daughter of Kerry Berchem and Craig Goos of Fairfield, has been named to the dean’s list at Hamilton College in Clinton, N.Y. for the 2017 fall semester. Goos, a first-year student, is a graduate of Hopkins School. Submissions will be accepted through Jan. 22. IMAGES 2018 provides an opportunity for artists to connect with prominent collectors, gallery owners, fellow photographers, and the public.